How do I bulk upload my customer data? 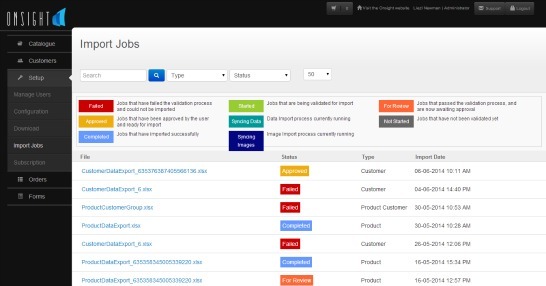 The bulk upload tool for customers allows you to import or update all your customers in one step. If you already have customer information in your Onsight account, clicking on the “Download” button will download all existing information in the form of an Excel spreadsheet. If no Customer information is available, clicking on the “Download” button will provide you with a blank Excel spreadsheet with all of the necessary columns. This will help you to more easily know what information you need to enter to have a successful upload. Each row in the Excel spreadsheet you downloaded in Step 1 represents one customer and each column is a field for that customer’s information. Let’s go through them one by one. The Onsight ID is a unique number we give each customer to help identify them. If you are entering new customers, you must leave this column blank and if you are updating existing customers, then keep the same Onsight ID that was downloaded in the sheet to start with so that we update the correct customer’s data. Fill in the customer’s company name. This field refers to the sales reps that are allocated to that specific customer. You can choose one or more reps to add to this field. This is a required field since each customer needs to belong to at least one sales rep. Sales reps who are not allocated to a customer will not be able to see that customer’s information nor will they be able to create orders for that customer. If multiple sales reps are allocated to a customer then they will all be able to see that customer, they will all be able to create orders for that customer, and they will all see the entire order history for that customer (including orders created by other reps). This field must contain an email address for a registered User in the Onsight system. If your customer is allocated to more than one sales rep, you can enter more than one email address by separating each one with a comma. For example, if you have users called Joe Blogs and Fred Sales, and their email addresses are joe@xyz.com and fred@xyz.com, then to allocate a customer to both of these users enter joe@xyz.com, fred@xyz.com in the Allocated To column. This field should contain a comma-separated list of Groups to which the customer belongs. You can create as many groups as you like and then assign pricing rules to products for these groups. For example, to allocate a Customer to hypothetical Retail, Premium, London and 2nd Tier groups you’d simply put “Retail, Premium, London, 2nd Tier” into the “Customer Group” column of that Customer’s row. More information on customer groups can be found in this article. This field can be set to either “Yes” or “No”. Inactive customers will not be displayed in the list of customers in the app. Fill in the contact details for your customer. Fill in the main address for your customer. Fill in the shipping address for your customer. Use this field to indicate whether or not you want your customers to be able to log into the app to place orders themselves. If this field is set to ‘Yes’ they can log in and place orders. See this guide on how customer self-ordering works. If this field is set to ‘Yes’, this is a new customer record, and your have configured automatic login notifications then they will automatically get an email explaining their access and letting them create their own password. See this guide on how to notify your customers about their logins. This is used for integration purposes. Unless you have integrated your systems into ours, you should leave this field blank. The Custom Field columns will only appear if you have defined Custom Fields for your customers and if you have created some values for those custom Fields. The columns will be named: ‘Custom Field Name 1’ and ‘Custom Field Value 1’ , etc. . Custom fields allow you to store additional information for each of your customers. This will then be displayed in the customer database on the mobile app. It can also be displayed on your orders and quotes. Custom fields can be added by inserting additional columns after the categories columns. To upload the completed Customer data spreadsheet, simply click on “Select File” from the same popup window where you downloaded the data sheet and which was mentioned in “Step 1: Downloading your Data”. Next, click on “Import” in the popup window. Your data sheet will now be processed and validated. If your spreadsheet passes validation you will be shown a list of all the updates that will take place once you approve the import job. If the spreadsheet validation is unsuccessful, you will be shown a list of errors you need to rectify before you can retry the upload process. 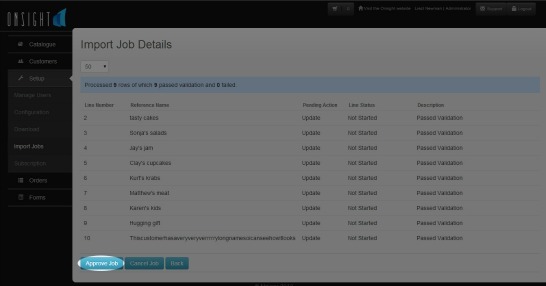 Once you are happy with all updates shown to you and no errors appear, just click “Approve job” and all your information will be imported into the database. Keep in mind that import jobs process one at a time, so they might not start immediately.